New information and communication strategies, globalisation, consumer preferences: Tourism markets and enterprises have gone through some rather dramatic changes. This volume provides you with practical information on managing changed customer demands, managing the new tourism destination and changing factor conditions. 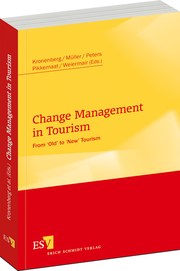 With practical examples and recommended actions for a successful change management in tourism.